This article is about the Brazilian state. For the city, see Rio de Janeiro. For other uses, see Rio de Janeiro (disambiguation). Rio de Janeiro (Portuguese pronunciation: [ˈʁi.u dʒi ʒɐˈnejɾu] River of January) is one of the 27 federative units of Brazil. It has the second largest economy of Brazil, with the largest being that of the state of São Paulo. "Conduct the affairs of the public with righteousness"
The state of Rio de Janeiro is located within the Brazilian geopolitical region classified as the Southeast (assigned by IBGE). Rio de Janeiro shares borders with all the other states in the same Southeast macroregion: Minas Gerais (N and NW), Espírito Santo (NE) and São Paulo (SW). It is bounded on the east and south by the South Atlantic Ocean. Rio de Janeiro has an area of 43,653 km2 (16,855 sq mi). Its capital is the city of Rio de Janeiro, which was the capital of the Portuguese Colony of Brazil from 1763 to 1815, of the following United Kingdom of Portugal, Brazil and the Algarves from 1815 to 1822, and of later independent Brazil as a kingdom and republic from 1822 to 1960. The archaic demonym meaning for the Rio de Janeiro State is "fluminense", taken from the Latin word flumen, meaning "river". Despite the fact "carioca" is a most ancient demonym of Rio de Janeiro's inhabitants (known since 1502), it was replaced by "fluminense" in 1783, when it was sanctioned as the official demonym of the Royal Captaincy of Rio de Janeiro (later Province of Rio de Janeiro), a few years after the City of São Sebastião do Rio de Janeiro has become the capital city of the Brazilian colonies. From 1783 and during the Imperial Regime, "carioca" remained only as a nickname by which other Brazilians called the inhabitants of Rio (city and province). During the first years of the Brazilian Republic, "carioca" was the name given to those who lived in the slums or a pejorative way to refer the bureaucratic elite of the Federal District. Only when the City of Rio lost its status as Federal District and became a Brazilian State (Guanabara State) when the capital was moved to Brasília earlier in 1960, "carioca" was made a co-official demonym with "guanabarino". In 1975, the Guanabara State was ended and extinct by President Ernesto Geisel (under the military dictatorship) becoming the present City of Rio de Janeiro and "carioca" was made the demonym of its municipality. Although "carioca" is not recognized as an official demonym of Rio de Janeiro State, Brazilians call the inhabitants of Rio de Janeiro in general (State and city) as "cariocas", and most of its inhabitants claim to be "cariocas". Nowadays, social movements like "Somos Todos Cariocas" ("We are all Cariocas") have tried to achieve the official recognition of "carioca" as a co-official demonym of the Rio de Janeiro State. The state's 22 largest cities are Rio de Janeiro, São Gonçalo, Duque de Caxias, Nova Iguaçu, Niterói, Campos dos Goytacazes, Belford Roxo, São João de Meriti, Petrópolis, Volta Redonda, Magé, Macaé, Itaboraí, Cabo Frio, Armação dos Búzios, Angra dos Reis, Nova Friburgo, Barra Mansa, Barra do Piraí, Teresópolis, Mesquita and Nilópolis. Rio de Janeiro is the smallest state in the Southeast macroregion and one of the smallest in Brazil. It is, however, the third most populous Brazilian state, with a population of 16 million of people in 2011 (making it the most densely populated state in Brazil) and has the third longest coastline in the country (after those of the states of Bahia and Maranhão). In the Brazilian flag, the state is represented by Mimosa, the beta star in the Southern Cross (β Cru). European presence in Rio de Janeiro is as old as Brazil itself, dating back to 1502. Rio de Janeiro originated from parts of the captainships of de Tomé and São Vicente. Between 1555 and 1567, the territory was occupied by the French, who intended to install a colony, France Antarctique. Aiming to prevent the occupation of the Frenchmen, in March 1565, the city of Rio de Janeiro was established by Estácio de Sá. In the 17th century, cattle raising and sugar cane cultivation stimulated the city's progress, which was definitively assured when the port started to export gold extracted from Minas Gerais in the 18th century. In 1763, Rio de Janeiro became the capital of Colonial Brazil. With the flight of the Portuguese royal family from Portugal to Brazil in 1808, the region soon benefited from urban reforms to house the Portuguese. Chief among the promoted changes were: the transformation of agencies of public administration and justice, the creation of new churches, and hospitals, the foundation of the first bank of the country - the Banco do Brasil - and the Royal Press, with the Gazette do Rio of Janeiro. The following years witnessed the creation of the Jardim Botânico (Botanical Garden) and the Academia Real Militar. There followed a process of cultural enhancement influenced not only by the arrival of the Royal Family, but also by the presence of European graphic artists who were hired to record the society and Brazilian natural features. During this same time, the Escola Real de Ciências, Artes e Ofícios (The Royal School of Sciences, Arts, and Works) was founded as well. Palácio Tiradentes, seat of the Legislative Assembly of Rio de Janeiro. Palácio Guanabara, seat of the state government. In 1834, the city of Rio de Janeiro was transformed into a "neutral city", remaining as capital of the state, while the captainships became provinces, with headquarters in Niterói, a neighboring city. In 1889, the city became the capital of the Republic, the neutral city became the federal district and the province a state. In 1894, Petrópolis became the capital of Rio de Janeiro, until 1902 when Niterói recovered its capital status. With the relocation of the federal capital to Brasília in 1960, the city of Rio de Janeiro became Guanabara State. Niterói remained the state capital for Rio de Janeiro state, while Rio de Janeiro served the same status for Guanabara. In 1975, the states of Guanabara and Rio de Janeiro were merged under the name of Rio de Janeiro, with the city of Rio de Janeiro as state capital. The symbols of the former State of Rio de Janeiro were preserved, while the symbols of Guanabara were kept by the city of Rio de Janeiro. Tropical forests used to cover more than 90% of the territory of Rio; large portions were devastated for urbanization and for plantations (coffee, sugar cane); preserved areas can be found in the steepest parts of the mountain chains. According to the IBGE of 2008, there were 15,772,000 people residing in the state. The population density was 352.58 inhabitants per square kilometre (913.2/sq mi). Urbanization: 96.9% (2004); Population growth: 1.3% (1991–2000). Quitandinha Palace in Petrópolis, a city with a strong German influence. Participation in the Brazilian economy: 15.6% (2004). There are 3,915,724 vehicles in the state (as of Jan. 2006), 10 million mobile phones, 5.3 telephones, and 92 cities. The state of Rio de Janeiro has the 4th best education in Brazil, second only to the Federal District, São Paulo and Goiás. The state has the fourth lowest illiteracy rate in Brazil, about 4% of its population. The illiteracy rate in the state is compared to countries like Singapore, Portugal, and China. Most of the state's leading universities are public. The most prestigious university is the Federal University of Rio de Janeiro, the second best in Brazil, and fifth best in Latin America, second only to the University of São Paulo, the best in Latin America, according to the QS World University Rankings. The occasion of the last five days leading up to Lent is annually cause for a great explosion of joy in Rio – a round-the-clock party uniting emotions, creativity, plasticity, colours, sounds and much fantasy. It is the greatest popular party in the world, a unique record of the rich cultural melting pot typical of Brazil. In Rio, it is celebrated in various ways, most famously through the elaborate competition of samba schools comprising thousands of dancers in each school, each of which has composed a new "enredo de samba" (samba script) for the year that is released and popularized by the time Carnaval arrives, thus already recognizable for its lyrics, themes, and rhythms by the energized audience in the bleachers thronging to see the all-night competition of one samba school after another until dawn. Each samba school consists of 'alas' (wings) of samba dancers costumed to carry out one aspect of the theme of the song they all sing. This event began in the 1930s as a diversion for what politicians sought to assuage as an otherwise restive populace. It came to be held on the bleacher-lined Marques du Sapucai for decades until a covered sambadrome was built in the 1980s. The film Black Orpheus is set in the context of Carnaval in Rio. Fireworks over Copacabana Beach, Rio de Janeiro City. 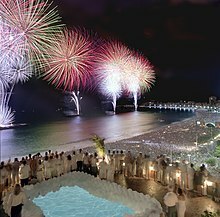 In Rio de Janeiro, a globally unique New Year's Eve celebration involves the whole city population. Local inhabitants and visitors join in flocking to the ocean to celebrate the night of the year when thanks are given and wishes are made to the goddess of the sea, Iemanja. In honor of her traditional garb, celebrants dress in white and bear gifts like flowers, especially white, and even blancmange. At midnight, beachgoers on the typically hot midsummer night, walk into the surf and cast their flowers (and wishes for the coming year) on the lapping waves to be carried out to honor the goddess. Nearby parties, concerts and music last into the dawn, many choosing to sleep it off on the beach on New Year's Day. In recent years, campfires and the oral tradition of shared stories around statues of Iemanja has modernized into massive fireworks displays and to a mega-concert on the famous beach of Copacabana. Since August 2004, with the transfer of many flights from Santos Dumont Airport, to Rio de Janeiro-Galeão International Airport, Rio de Janeiro has returned to being the main doorway to Brazil. According to data from the official Brazilian travel bureau, Embratur, nearly 40% of foreign tourists who visit Brazil choose Rio as their gateway, meaning Galeão Airport. Besides linking Rio to the rest of Brazil with domestic flights, Galeão has connections to 18 other countries. It can handle up to 15 million passengers a year in two passenger terminals. Located 20 kilometers from downtown Rio, the international airport is served by several quick access routes, such as the Linha Vermelha/Red Line and Linha Amarela/Yellow Line freeways and Avenida Brasil/Brazil Avenue, thus conveniently serving residents of the city's southern, northern and western zones. There are special shuttle buses linking Galeão to Santos Dumont, and bus and taxi service to the rest of the city. The airport complex also has Brazil's longest runway at 4,240 metres (13,910 ft), and one of South America's largest and best equipped cargo logistics terminals. BR-040 highway in the mountainous region of Rio de Janeiro. Construction is underway on a new Port of Açu. The port will cover 36 square miles. This USD 1.6 billion project at Sao Joao da Barra, approximately 280 kilometers from Rio de Janeiro, has been under construction since October 2007 and will be operational in 2013. It is forecast that the port will eventually handle over 63 million tons of iron ore, 10 million tons of steel products, 15 million tons of coal, 5 million tons of dry bulk and 7.5 million tons of general cargo. A breakwater damn to protect ships from ocean waves is also planned. Sports are a very popular pastime in Rio de Janeiro. The most popular is association football. Rio de Janeiro is home to four traditional Brazilian football clubs: Flamengo, Vasco, Fluminense and Botafogo. The state football league is Campeonato Carioca. The city of Rio de Janeiro hosted the 2014 FIFA World Cup. The city built a new stadium near the Maracanã, to hold 45,000 people. It was named after Brazilian ex-FIFA president João Havelange. Other notable sports events in Rio include the MotoGP Brazilian Grand Prix and the World Beach volleyball finals. Jacarepaguá was the place of Formula One Brazilian Grand Prix into 1978-1990 and the Champ Car event into 1996-1999. WCT/WQS Surf championships were contested on the beaches from 1985-2001. On 2 October 2009, Rio de Janeiro was selected to host the 2016 Olympic Games, which will be the first to be held in South America. The games began in August. Two years ago, in 2014, the FIFA games were held. Much of the infrastructure was used again. An eagle, symbol of Brazil's royal family, appears on the state flag with the rock formation Dedo de Deus ("The Finger of God") near Teresópolis in the background. The outer part of the coat of arms represents the state's agricultural richness, sugarcane (left) and coffee (right). Flag (unknown) of the Captaincy of Rio de Janeiro (1565 – 1821). Nova Friburgo, known as "Rio's Switzerland"
^ "STIMATIVAS DA POPULAÇÃO RESIDENTE NO BRASIL E UNIDADES DA FEDERAÇÃO COM DATA DE REFERÊNCIA EM 1º DE JULHO DE 2017" (PDF). IBGE. Retrieved 22 April 2018. ^ a b "Produto Interno Bruto do Estado do Rio de Janeiro". Retrieved 22 April 2018. ^ In the variety of Brazilian Portuguese spoken in Rio de Janeiro, according to Larousse Concise Dictionary: Portuguese-English, 2008, p. 339 (in which the pronunciations "refletem a língua falada no Rio de Janeiro"). The European Portuguese pronunciation is [ˈʁi.u ðɨ ʒɐˈnɐjɾu]. ^ "Emperor Street". World Digital Library. 1860–1870. Retrieved 2013-08-24. ^ Sistema IBGE de Recuperação Automática - SIDRA (PDF) (in Portuguese). State of Rio de Janeiro, Brazil: IBGE. 2008. ISBN 85-240-3919-1. Retrieved 2014-08-24. ^ Antônio Eugênio Taulois (February 2007). "História de Petrópolis" (in Portuguese). Archived from the original on 29 December 2014. Retrieved 28 November 2014. ^ Os lusíadas na aventura do Rio moderno. Retrieved 2014-08-24. ^ "A Colônia Suíça de Nova Friburgo". Multirio.rj.gov.br. Retrieved 2014-08-24. ^ Magalhaes, Luciana (April 1, 2013). "Credibility Hangs on Unfinished Port, Ambitious Project of Brazilian Billionaire Is Important Both for Nation's Infrastructure and to Prove Doubters Wrong". Wall Street Journal. ^ Gibson, Owen (October 2, 2009). "Olympics 2016: Tearful Pele and weeping Lula greet historic win for Rio". The Guardian. London. ^ "History (Nova Friburgo)" (in Portuguese). 1 January 2014. Archived from the original on 5 December 2014. Retrieved 29 November 2014.